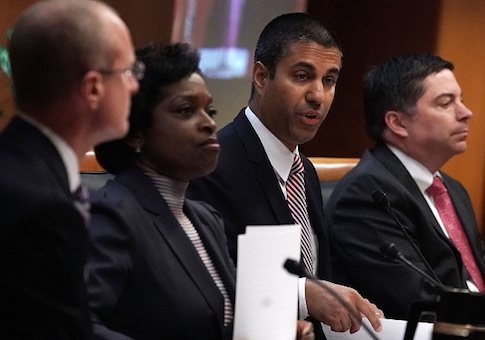 Federal authorities have arrested a man in Los Angeles for threatening Chairman of the Federal Communications Commission Ajit Pai’s family. Markara Man, 33, was angry at Pai for repealing the Barack Obama administration's net neutrality regulations and sent threats in order to "scare" him, according to a Justice Department press release. Man is alleged to have included a framed picture of Pai’s family in one email, and in another he listed the locations of preschools in Arlington, Va., where Pai lives. "I will find and kill your children," Man allegedly wrote. Pai has faced vitriolic attacks for his decision to repeal net neutrality regulations, and Man emailed him to blame him for the death of a child who had supposedly committed suicide over that repeal. "The first email accused Chairman Pai of being responsible for a child who allegedly had committed suicide because of the repeal of net neutrality regulations," the DOJ said. "The second email listed three locations in or around Arlington, and threatened to kill the Chairman’s family members. The third email had no message in its body, but included an image depicting Chairman Pai and, in the foreground and slightly out of focus, a framed photograph of Chairman Pai and his family." Man’s location was traced to Norwalk, California. He had used the email address "STUBBLEMANLINESS@GMAIL.COM" in order to hide his identity and sound "tougher," according to the affidavit. "Man is charged with a threatening to murder a member of the immediate family of a U.S. official with the intent to intimidate or interfere with such official while engaged in the performance of official duties, or with the intent to retaliate against such official on account of the performance of official duties," the DOJ added. Man wrote an apology letter to Pai that he gave law enforcement. "I'm sorry I made a threat against your kids. That was crossing the line. I hope you'll change your mind … but I doubt it," Man said. This entry was posted in Politics and tagged Department of Justice, FCC. Bookmark the permalink.